While it's difficult to throw out any piece of homework, any doodle, or any quiz, keeping every single accomplishment from school can get unruly. 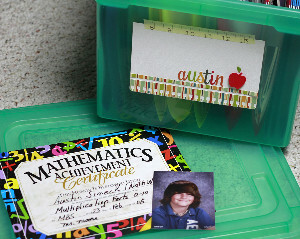 Instead, use the School Days Memory Box to keep you organized. With the help of this tutorial, you'll learn what is important to keep and what you won't regret tossing. Home organization ideas don't need to wait until the new year to be tackled. Start today, and you'll feel accomplished and refreshed. It can be difficult to know how to declutter when it seems like every sheet is significant, but read these instructions and you'll feel great about purging. There are also some fabulous ideas on how to compact memories in a less bulky way. As early as preschool, kids generate a ton of keepsake material: artwork, homework assignments, sports photos, report cards…the list goes on & on, and the papers can simply pile up. 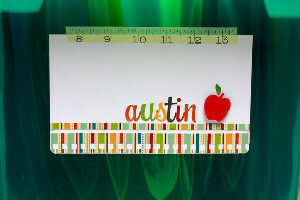 Tame the paper and preserve the memories with this easy filing system. Assign a tub for each child. 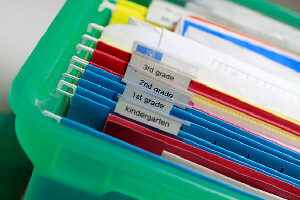 Set up the filing system by assigning one hanging file for each grade. It’s that simple! Now you just need to establish an easy-to-follow process for using the filing system to your advantage. Homework Papers- Take some time to edit homework papers at the end of each week. Although tempting, there’s simply no need to keep every slip of paper. Focus on tests, essays, and your child’s best work. Anything that features handwriting will be treasured in years to come. Slip these papers into the grade file – no further filing is necessary! Artwork- As crafters, it’s so hard to throw out children’s creative masterpieces! File away smaller pieces. For larger artwork (and/or 3D projects), snap a well-lit photograph. Display the actual art somewhere in the house for a month, then feel free to toss it (or share with grandparents!). Create a digital file by child, grade, and year on your hard drive. At the end of the year, burn a disc of photos and slip it into the file. Sports Memories- Team photos, rosters, and newspaper clippings are terrific keepsakes to remember your child’s athletic achievements. Using a catalog size envelope (9x12), create a file-within-a-file for each sport. When the season is over, slip the envelope into the grade file. Yearly Quizzes- Add a personal touch to each grade file by including an “interview” from the beginning and end of the year. At the beginning of the year, ask your child what they’re looking forward to, who they are friends with, and what they are nervous about. At the end of the year, ask about favorite classes, best memories, and what they’ll miss. It will be a blast to look back on their answers! i love this idea i am going to it with my 2 kids.